A general view of Target Field before the game between the Minnesota Twins and the Seattle Mariners on April 5, 2018. Nature is exacting revenge on the state of Minnesota for whining so much about fans of the Philadelphia Eagles, who beat the living daylight out of the Vikings in the NFC Championship game, in case you all forgot or something. 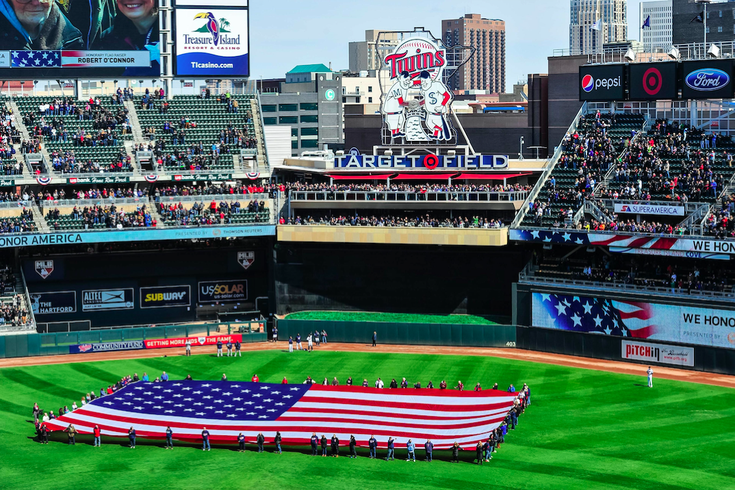 On Thursday, as the Minnesota Twins celebrated their home opener against the Mariners, the American Eagle Foundation was on hand with a very special bald eagle. Challenger, a 28-year-old rescue eagle featured routinely on game days at Lincoln Financial Field, was on hand at Target Field to add festivity to the Twins' opening ceremonies. Things went awry after the national anthem, when Challenger lunged at Seattle Mariners pitcher James Paxton. "I guess the eagle knew I was Canadian. I don't know. But it came for me," Paxton said after the game, according to CBS News. Paxton's Canadian citizenship could only have been second in importance to ruining things for Minnesota, although the Twins did pull out a 4-2 victory. Maybe Challenger was climbing on Paxton's shoulder to show support for the Mariners. It might not have been an attack at all. The Washington Post noted earlier this year that Challenger enjoys free reign to determine his flight path during his few minutes in the spotlight. Eagles fans are currently the subject of an NFL investigation after the league received complaints about behavior during the NFC Championship game against the Vikings. The two teams will kick off the 2018-19 NFL season at Lincoln Financial Field in September. We can only hope Challenger will be in attendance.